Mare Barrow's world is divided by blood - those with red and those with silver. Mare and her family are lowly Reds, destined to serve the Silver elite whose supernatural abilities make them nearly gods. Mare steal what she can to help her family survive, but when her best friend is conscripted into the army, she gambles everything to win his freedom. A twist of fate leads her to the royal palace itself, where, in front of the king and all his nobles, she discovers a power of her own - an ability she didn't know she had. Except... her blood is Red. To hide this impossibility, the king forces her into the role of a lost Silver princess and betroths her to one of his own sons. As Mare is drawn further into the Silver world, she risks her new position to aid the Scarlet Guard - the leaders of a Red rebellion. Her actions put into motion a deadly and violent dance, pitting prince against prince and Mare against her own heart. I've done my very best to remove all the hype from my mind. I've done my very best to remove its similarities from Red Rising. I've done my very, very best to look at the good things on this novel since some readers have claimed it to be great. Red Queen has that formulaic dystopian setting where lower class people are openly oppressed. Where the government is handled by people with power and they have their own internal conflicts. Politics being played around by those with power. Family hierarchy is present. The powers were quite generic. Elemental. I mean I don't find it really interesting or fascinating or anything else although I have to admit that the idea about blood color caught my attention. I like dystopian novels because of all the political warfare - the thirst for power and how everyone fights for it mixed with an elaborate rebellion going on. Red Queen had all that but not executed in a way that really engaged me. I find the family and ability system quite interesting (heavily reminded me of Red Rising though particularly on the family alliances). Mare Barrow is a strong and determined heroine. I think she's well established but I did not really like her. I think that she looks so low on her friend, Kilorn. I think that she tries to shoulder everything. I think that she's too trusting although she tries not to. Actually, I think everyone in the novel is too trusting (even the rebellion group, Scarlet Guard. Seriously the way they accept new members is just too convenient. ugh). Let's talk about the three men in Mare's life: Kilorn, Cal, and Maven. I think that Kilorn is such an inconsistent or maybe convenient character. At first he was such a wimpy character and Mare is treating him as one then next thing I know he's joining the rebellion. Just what is up with that? Cal and Maven's relationship were gradually established as Mare lives with them. I like both Cal and Maven. I like Cal's loyalty to his father, to his blood, and to his position. I think that he's worthy for the throne. Maven, on the other hand, is a well established character. While I've somehow seen through the things he's doing, I still liked his character. Red Queen is pack with twists. I expected and completely predicted some of them generally because I've come across too many reviews hinting of twists (so yeah, I read too much when that happens). Here's the thing about it: if you really look through everything, you'll see through what will happen; if you look back at Red Queen following through a general formula (and maybe comparing it to similar books), you'll see through what will happen; and obviously if you look through the next pages and chapters, you'll know what will happen. What I'm generally saying is that it's easy to see through Red Queen. There are interesting twists but they're predictable. 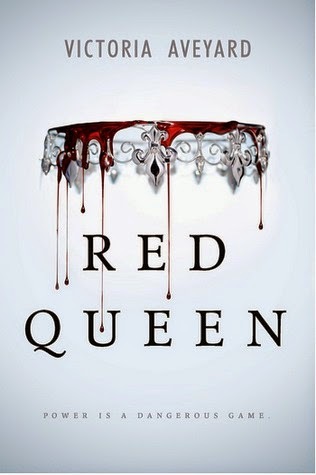 OVERALL, Red Queen is a nice dystopian fantasy read. I enjoyed it and would love to read what happens next. It's got an interesting world, a well established heroine, and a good amount of twists (but really, don't expect so much since they're predictable). While I did not completely like some of the elements of the novel, I still recommend Red Queen for those who enjoy dystopian fantasy novels. I think readers who enjoy book series with characters that have powers (or unusual abilities) will like this series.